You are receiving this as you are subscribed to Vinodiversity News. A brief note with an important message, an urgent note and an earnest reminder. 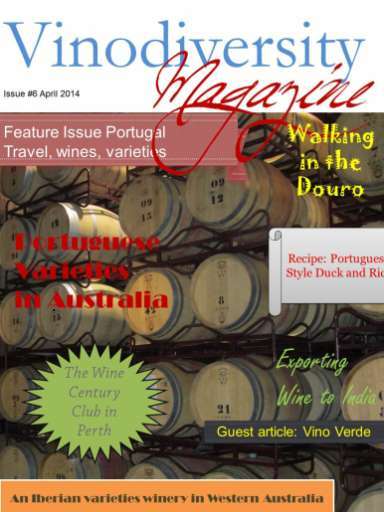 The April Issue of Vinodiversity Magazine is now published. It is available in the Apple Newsstand. There are some stories related to the monthly theme of Portugal, its wine, food and travel attractions. We also have a stories about the Wine Century club in Perth, and a guest article about exporting wine to India. Due to a late cancellation we have a couple of seats available at a special wine dinner in Richmond, Vic tonight, Tuesday 29 April. We will have a few rather special wines to share. If you are in the Wine Century Club, or an aspiring member, then I can almost guarantee that you will add to your tally. We will be meeting at an Italian restaurant in Richmond where we have negotiated an economical package for a meal and corkage. Numbers are strictly limited. Please email me ASAP if you are interested in attending. Or phone 03 9397 7971 before 3pm today. I will be unable to post wine variety charts and wine maps after Monday 5 May. I will resume normal mailing after 16 June.